Read about us in the MIT News! 1555 Massachusetts Avenue, Harvard Square, Cambridge. Main work: the beautiful Stabat Mater of the 18th century Maltese/Neapolitan composer, Girolamo Abos, with string ensemble and organ. The program will also include three French opera choruses, and an example of Gregorian chant. The public is also invited to our dress rehearsal, (piano accompaniment), May 4, 1 pm, MIT Theater. Limited on-street parking is available on Vassar Street. Announcing the release of our first professionally-produced recording!!! 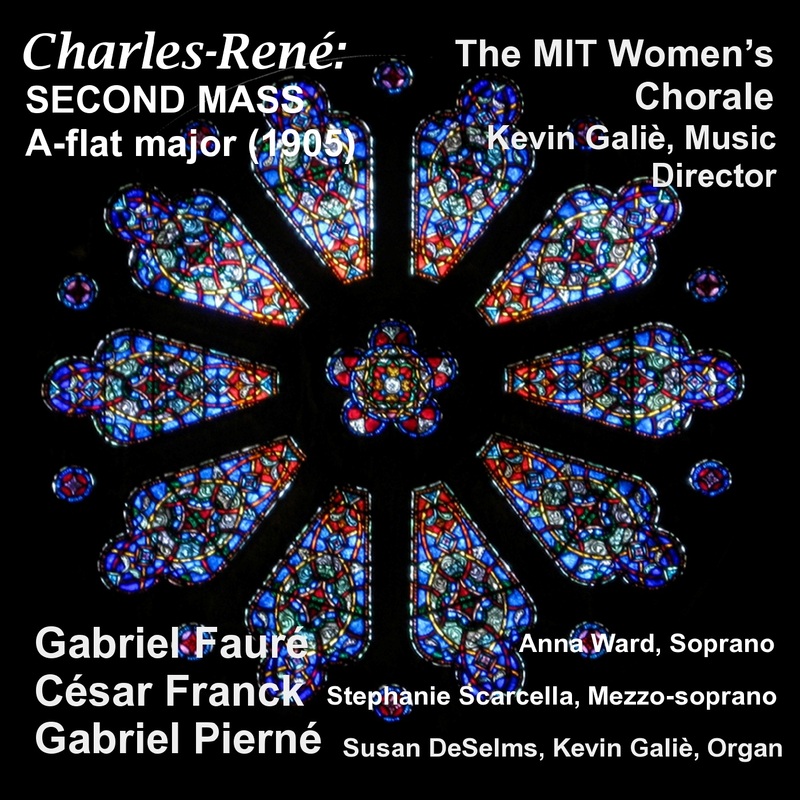 Charles-René: Second Mass, a never-before recorded mass for women's voices and organ published in France in 1905, presented with other French choral and organ music of the period. This recording is now on sale, both as a physical CD and as a digital download. Detailed ordering information is given here. 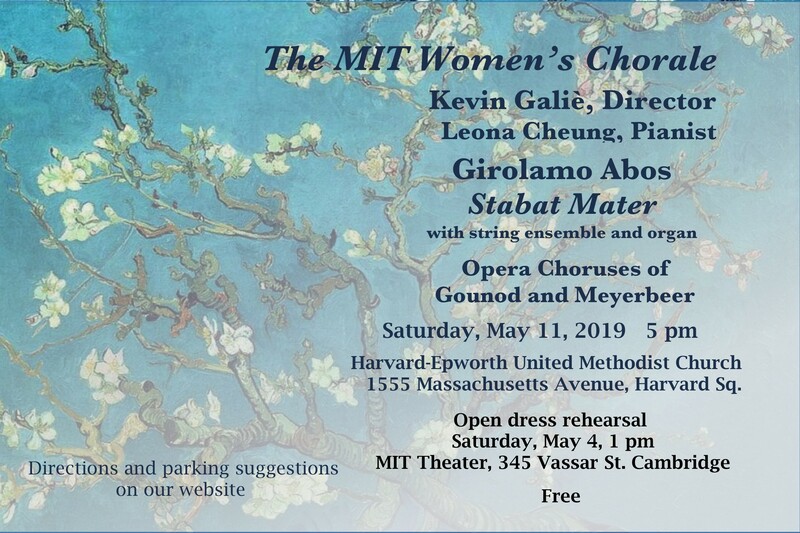 The MIT Women's Chorale is a concert choir sponsored by the MIT Women's League, and is open to all women of the MIT and Harvard communities and a small number of guests at the discretion of the director. In October 2008, the Chorale welcomed Kevin Galiè as our Music Director and Conductor. The Chorale welcomes Leona Cheung as our accompanist beginning in September 2018. Our repertoire covers a wide range of styles, from medieval to contemporary, including both sacred and secular music. The Chorale performs two or more concerts each year. These include a holiday concert held in December, and a spring concert, usually held in April or May. Rehearsals are held on Wednesday evenings from 7:15 to 9:30pm in the Emma Rogers Room (10-340) at MIT. We work hard to prepare for each concert, so a commitment to regular attendance is expected from our members. We are enriched by the diversity of our membership, which includes women of a wide age range and women from the international communities at MIT and Harvard. While our primary focus is singing, we end each evening with conversation over light refreshments. We also hold a pot luck supper each semester. The interactions fostered by the Chorale have led to many life-long friendships. The Chorale is a member of the Greater Boston Choral Consortium. Announcement of Chorale activities will appear in the bulletins of the MIT Women's League and Harvard Neighbors. The MIT Women's Chorale is on Facebook--become a fan today! In case of snow or other bad weather, please check here for updated information as to whether or not rehearsal will be held.